Home Automation – From Dream to Reality – Planet Geek! The whole Home Automation craze has been around for years. From the first X10 devices in the 70s and 80s, all the way through wifi enabled refrigerators, the technology to link devices and services in the home has marched onward. I certainly am not immune to the draw of a ‘smart home’, where all my devices are interconnected and can communicate with each other (and I can communicate with them! ), but up until recently, the tech for this has been clunky and unimaginative. Sure you could have a big multibutton wired box on your coffee table that could turn on the kitchen lights, but that’s not particularly convenient. No, the big revolution came when always-on, integrated voice controlled devices like Amazon’s Echo Dot and the Google Home successfully bridged the human / computer interface with easy to use voice commands that didn’t require you to speak like Robbie the Robot. With natural language interfaces available 24/7, without requiring physical button pushing or training, home automation could start to move into the “this makes things easier” territory. I’ve naturally been attracted to this sort of integration. Having a whole-house ‘personality’ that I could talk to anytime, anywhere, without it being intrusive or burdensome was a big attraction. The first step to this process was getting Amazon Echo devices in all the rooms. This turned out to be less of a challenge than I expected. Echo Dots are going for $40 and are a decent starting point. I was setting up for the 4 rooms in my house, so this was easy (with a full Echo in the living room for good ambient music and general use. Even before I started setting up the next stage of automation, we found having a House Bot to be incredibly convenient. Having an Echo in every room, you get very comfortable having basically any answer to any question available just by asking. “Alexa, What’s the capital of Wisconsin?”, etc etc. Shopping lists – being in the kitchen and realizing we’re almost out of sugar “Alexa, add Sugar to the shopping list” (“I’ve added sugar to your shopping list.”) – when one of us is at the supermarket, we can look at the current list on our phone and see what’s needed, marking things off as we get them. Timers – This one was a little surprising. “Alexa, set a timer for 10 minutes.” “I’ve set a timer for 10 minute, starting now.” – this is a great reminder service for anything from something in the oven to remembering to go leave to go pick up your kid. Music – I have our accounts linked to Spotify, which means I basically have access to all the music in the world, as well as many curated playlists. A lot of times I’ll come down in the morning for coffee, and put on some music with “Alexa, play quiet classical music” – and a nice mix of quiet music will start playing. Background sounds – We have an active house and neighborhood. Sometimes a nap is needed, and perhaps the general churn of kids playing and doors closing can make that difficult. Asking Alexa to play quiet sounds helps make napping easier. “Alexa, play ocean sounds” is a great way to set some soothing sounds to take a nap to. Okay, all this is great, but what about the other automation stuff? The lights! 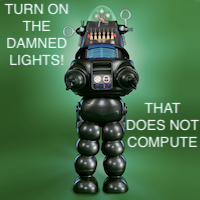 What about the lights? There’s a lot of technologies to do this. With LED lightbulbs replacing CF bulbs (for good reason), zillions of companies started making WiFi enabled lightbulbs. I’ll be honest, these things seem sketchy AF. This is a fully enabled wifi computer in a lightbulb socket in your house, on your local network. Most people don’t know what those devices are doing, and what external services they’re communicating with. There’s a school of thought that says “Who cares? It’s just a lightbulb!” – but that’s not the point. That’s not a lightbulb, it’s a computer. It’s on your local wireless network in your house. Which means it has localized access to all the devices on your network at home. That nice firewall / router you have? It’s just been bypassed. Now, many could argue that this is already happening, with the smart devices like the Echos and other things in the house, which are in regular communication with servers on the internet. And they’d be right – there’s communication happening there that I’m not in 100% control of. But, with a hefty dose of salt, I honestly trust Amazon and Google a lot more than a Chinese company making a $19 Wifi enabled lightbulb that asks me to install an Android app to control the light. Do I blindly trust Amazon and Google? Heck no! But I know a lot of very smart people are analyzing what the Echos and the Google devices are doing. There’s far more transparency there than these fly by night “Smart Device” manufacturers on the net. Right. Enough of that. Let’s get down to how I built out my network. First of all, if you’re not going to use wifi, you need to pick another wireless protocol. There’s several to choose from, I ended up choosing Zwave. This is a very common protocol, and has many devices and hubs supporting it. When I started this project 2+ years ago, Zwave devices tended to be on the pricy side, but the costs have been steadily dropping. Once you’ve selected a protocol, you’ll need a hub. A hub does all the communication with the devices, and presents that communication to whatever interface you’d like to use. In my case, I wanted a dozen or two devices, and I wanted to talk to them via Alexa as well as web and mobile apps. This is a pretty normal ask, nothing too fancy. I ended up buying a Vera Plus hub. It was relatively inexpensive (at the time, compared to others), had a decent developer community, and I had several friends at MakeIt Labs who were using them, so I had a place to ask questions. For my initial setup, I also bought 2 GoControl LB60Z-1 LED Bulbs. At the time they were about $35 each. The initial setup was pretty easy. I was able to get the bulbs synced with the hub, and I was able to get the hub communicating with Alexa (though this turned out to be something of a challenge, since the integration was still in beta. I hear that the Alexa integration is much smoother now). At this point, I had a system that would allow me to control the lights in our living room just by speaking out loud “Alexa, living room lights on please” or, if it was a movie night and we wanted subdued lighting, “Alexa, living room lights to ten percent please”. This all… surprisingly… worked really well! Having the lights in each room voice controllable was a huge win. I don’t like centralized lighting in a room. I’d rather have 4 lamps around the edges of a space than have one big light. Tying all the lights together in one ‘scene’ where they can all be turned on, off, or dimmed with one command was awesome. This setup ran for almost 2 years. After it was well established and the family had gotten very comfortable with having a true ‘home automation’ setup, I started to have some problems. The Vera Plus hub controller is, well, slow. It could take 5-10 seconds for a device to respond to commands, and occasionally the hub would disconnect from Alexa. The UI on the device was PAINFULLY outdated. It had the look and feel of something written by an intern 10 years ago, and they’ve been just maintaining / adding screens / updating forms on it since then, with no one willing to tackle replacing the UI with something more modern and less clunky. It all “worked”, but it was no fun to fiddle with. I also was interested in doing more integration. I wanted to have a ‘smart lightswitch’ setup where I could see the status of all the lights, and all the motion sensors, on a tablet on the wall. This wasn’t that idle a need – our houses are very tightly insulated. When someone comes in the front door, you can feel the pressure change in the air int he house, but it’s subtle. I wanted to be able to look up and see if someone had just come in the door downstairs, particularly if I was in the attic. It was time to look at upgrades. In the 2+ years I had been building this network, the technology had advanced, and there were many new offerings. The Google and Alex integrations had improved, and new devices were on the market. I started taking a good long look at the Samsung Smartthings Hub. I had heard about SmartThings, but had also heard the tools were not mature yet, and there were some serious concerns about privacy and stability. The third generation hub however was looking very nice, and many of the ‘mysteries’ about how these devices were communicating were being cleared up. I started watching the SmartThings subreddit and it looked like people were doing some good work, so I took the plunge and bought the hub. I won’t bore you with all the details of setting up the new hub and migrating the devices. The short version is “it happened”. There were naturally bumps (like, in order to migrate any Zwave device that’s already been set up to a new hub, you have to basically tell the device and the hub to deregister the old connection before you add the new one. This is accomplished via something called Z-Wave Device Exclusion, which seems counterintuitive, but it let me attach the devices to the new hub once I figured that out. The real pleasant surprise was that Samsung provides an “IDE” for working with Smartthings. It’s a very well designed UI that lets you go in and update, modify, browse, and configure every device attached to the system. This includes adding new functionality through community-written drivers and debugging connectivity issues. This IDE was a breath of fresh air compared to what I was working with on the Vera. I felt that Samsung understood that people doing Home Automation really want full control over the devices and the tools, without going nuts with hacky approaches to the system. Once the Smartthings hub was up and running smoothly, I wanted to go to my next project, which is having a ‘smart display’ showing the light and motion detector status. A while back, I picked up a handful of Amazon Fire HD 7″ tablets and modified them to be able to run the google Play store. I pulled out one of the tablets, charged it, got the software on it all the way up to date, and installed ActionTiles on it. ActionTiles is sort of the ‘standard’ tablet display application for people using SmartThings devices. 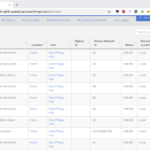 While not particularly elegant or fancy, it provides a clean, simpl touch interface to all the devices on your network. Setting it up and configuring it was pretty easy, and after tinkering with the layout a bit, I mounted the tablet in one of of the clamp brackets and set it over my desk. I at last had a live display of my device network that would notify me if the door sensors tripped while I was safely ensconced in my office. Victory! This has been running now for a day or two, and I’m super-happy with the results. I’m sure I’ll find things that need tuning and updating, but so far, the entire project has been a win. I have several ideas about the next steps, but that’ll have to wait for anther day.